INDIANAPOLIS, Ind., Feb. 27, 2019 – Greensboro, N.C., will be all gymnastics this weekend with the Triple Cup of gymnastics heading to the Greensboro (N.C.) Coliseum Complex. Anchored by the American Cup, the USA’s most prestigious international event and part of the International Gymnastics Federation’s all-around World Cup series, on March 2 at 11:30 a.m., the weekend kicks off with the Nastia Liukin Cup, which features many of the country’s top Junior Olympic female gymnasts, on March 1 at 7 p.m., and wraps up with the Elite Team Cup, a team event with many of the USA’s top junior men, at 6 p.m. on March 2. Fans will have the opportunity to see many of the USA’s rising stars in the Nastia Liukin Cup and Elite Team Cup, as well as many of the world’s best men and women, who have their sights on representing their countries in the 2020 Olympic Games, at the American Cup. 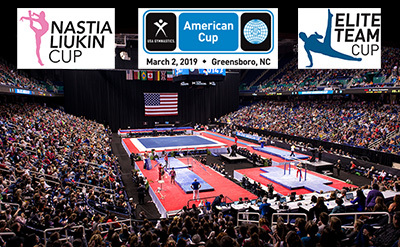 The fields for the American Cup and the Elite Team Cup are set, and the final two gymnasts for the Nastia Liukin Cup will qualify this week to compete at the Greater Greensboro Invitational, also being held at the Greensboro Coliseum Complex. The American Cup is a one-day, all-around competition, and the field features a mixture of Olympic and World medalists and rising stars, giving fans an up-close view of gymnasts to watch in the 18-month lead-up to the 2020 Olympic Games. Representing the United States at the 2019 American Cup are 2018 World team gold-medalist Grace McCallum of Isanti, Minn./Twin City Twisters; two-time World bronze-medalist Sam Mikulak of Colorado Springs, Colo./U.S. Olympic Training Center; World bronze-medalist and defending American Cup champion Yul Moldauer of Arvada, Colo./University of Oklahoma; and 2018 U.S. junior all-around champion Leanne Wong of Overland Park, Kansas/GAGE, who is making her debut as a senior. The international roster includes two-time Olympian and World silver-medalist Ellie Black of Canada; 2017 European Championships all-around bronze-medalist James Hall of Great Britain; 2018 World all-around silver medalist Mai Murakami of Japan; and five-time World gold-medalist Kenzo Shirai of Japan. Additionally, the men’s and women’s rosters include 2016 Olympians Christian Baumann of Switzerland, Bart Deurloo of the Netherlands, and Petro Pakhniuk of the Ukraine; two-time Olympian Kim Bui of Germany; and 2014 Youth Olympic Games two-time silver-medalist Ma Yue of China. Marcel Nguyen of Germany has withdrawn from the competition due to injury. The 2019 American Cup field, listed by country, is listed below. Held in conjunction with the American Cup, the Nastia Liukin Cup is named after the 2008 Olympic gold medalist and one of the USA’s most popular gymnasts. Gymnasts qualify through the Nastia Liukin Cup Series, which includes many of the country’s top invitationals held from January through February. For more information and to see the list of participants, go to nastialiukincup.com. The Elite Team Cup is a regional team event with nine teams of six gymnasts, who were chosen by each of the respective regions. The event’s field includes 13 members of the U.S. National Team: Lazarus Barnhill, Houston, Texas/Cypress Academy of Gymnastics; Fuzzy Benas, Richmond, Texas/EnRich Gymnastics and Dance Academy; Landen Blixt, Fowlerville, Mich./Infinity Gymnastics Academy; Brandon Briones, Gilbert, Ariz./Aspire Gymnastics; Taylor Burkhart, Morrison, Colo./5280 Gymnastics; Isaiah Drake, Los Angeles, Calif./Gymnastics Olympica; Raydel Gamboa, Phoenix, Ariz./North Valley Gymnastics; Nicolas Kuebler, Seattle, Wash./Metropolitan Gymnastics; Ian Lasic-Ellis, Dover, Mass./MEGA – Massachusetts; Riley Loos, El Dorado, Calif./Technique Gymnastics; Luke McFarland, East Hartford, Conn./Daggett Gymnastics; Colt Walker, Cedar Park, Texas/AcroTex Gymnastics; and Khoi Young, Bowie, Md./Sportsplex. For more information and the complete field roster, go to americancup.com/eliteteamcup. On the Greensboro Coliseum concourse, fans will have the opportunity to take photos in GK’s selfie station and browse through GK’s popular leotard styles, as well as purchase everything gymnastics, including event-specific tees, other apparel, and more at the merchandise booth. In addition to all-session ticket packages that range in price from $89-$149, single session tickets are available for all three events: American Cup, $59-$79; Nastia Liukin Cup, $39 general admission; and Elite Team Cup, $29 general admission. Ticket prices, which are plus applicable fees, vary according to seat location. All-session ticket packages include tickets to all three of the weekend’s events. To purchase tickets, call Ticketmaster’s charge-by-phone line at 800-745-3000, or visit ticketmaster.com or the Greensboro Coliseum Complex Box Office. Group tickets may be purchased by calling 336.373.7433. For more information, go to americancup.com. For fans who cannot attend in person, all three events are available live online, as well as the American Cup and Nastia Liukin Cup aired on TV. The Olympic Channel will broadcast the American Cup live from 11:30 a.m.-1 p.m. ET, with NBC’s live coverage beginning at 1 p.m. ET. The Nastia Liukin Cup will be televised live on the Olympic Channel at 7 p.m., as well as tape-delayed on NBCSN on March 2 at 11 p.m. ET. A live-stream of both events will be available at NBCSports.com or its app. The Elite Team Cup will also have a live webcast via the USA Gymnastics YouTube Channel. The Greensboro Coliseum Complex is also hosting the 2019 Greensboro Gymnastics Invitational Feb. 27-March 3. This is the second time the Greensboro Gymnastics Invitational, hosted by Flip Force Gymnastics, has been part of the Nastia Liukin Cup Series. In addition, designated women’s sessions for the invitational’s finals will use the equipment and podium brought in for the American Cup. The inaugural Elite Team Cup was held in 2014 in Colorado Springs, Colo. Most recently, the event has been staged in Newark, N.J, in 2016-17, and Hoffman Estates, Ill., in 2018. Greensboro Area Convention & Visitors Bureau. The Greensboro Area Convention & Visitors Bureau is an independent, non-profit governmental authority whose mission is to aggressively market Greensboro’s assets, maximizing economic impact while providing excellent visitor service. Guilford County ranks third in the state in travel and tourism expenditures, with over $1.41 billion generated in 2017 and more than 13,900 people employed in travel-related jobs. For more information: www.visitgreensboronc.com. Sports & Properties, Inc. SPI is a sports marketing and sports development firm concentrating in four primary areas of business: major sponsorships, including naming rights; sports tourism; sports & entertainment facilities; and major events. SPI recent projects include the Raleigh-Durham market’s Major League Soccer Application, the USA Masters Games, greater Hickory, NC, sports tourism, St. Pete Pier naming rights, and the Seminole County Sports Complex. Event projects include the National Collegiate Table Tennis Championships, U.S. Figure Skating Championships, and the American Cup. SPI clients include Capitol Broadcasting Company, the City of St. Petersburg, FL, the North Carolina Football Club, and the Greensboro Coliseum Complex, among others. For more information on SPI, visit sportsproperties.com.